Thumbing through my journals has unleashed a torrent of lost and, in some cases, intentionally forgotten memories. But it’s been almost 20 years to the day and I didn’t need any prompting to remember this cab ride. I had an interesting cab ride home tonight. The driver was French, which was unusual in and of itself. We started chatting and he asked me how I liked living in a slum. This isn’t a slum! Is it? He said he grew up outside of Paris, lived in Morocco for several years and has been in New York for the past 15. He said everywhere he’s been it’s the same; the slums are filled with blacks and Puerto Ricans. They’ve always been there and they’ll always be there. He said they don’t have the wherewithal to pull themselves out. He said, “People like you and me have The Panic in us. It’s The Panic that makes us get out of bed and go to work in the morning. But those people don’t have The Panic in them and because of that, they’ll always live in ghettos. It’s in their blood.” I couldn’t believe it. He said the difference between us and them (he actually said “us and them”) is that if someone gave him $50,000 and gave me $50,000 and gave someone in “the slum” $50,000, he and I would start a business and invest in our future but the slum person would just blow it. He doesn’t know me very well, does he? I wonder if he was serious about this stuff? He sure sounded sincere. I have a suspicion that he was one of those nutty out-of-work actors doing a Stanislavsky exercise. You know, inhabiting a character for a day. But he was kind of old to be an out-of-work actor. Old, white, French racist. I stiffed him on the tip just in case he was serious and for being a dickhead if he wasn’t. As long as I’m being dreary today, here’s a more contemporary example of how humanity is a disappointment. I had to run a mid-day errand. I always like to walk through Rockefeller Center and stop to watch the tourists on the ice skating rink. They’re all on vacation and in a good mood. I like to see people enjoying New York City. It makes me feel strangely vindicated for my choices in life. I know how that sounds. Don’t judge me. I stumbled across a living Currier and Ives print. 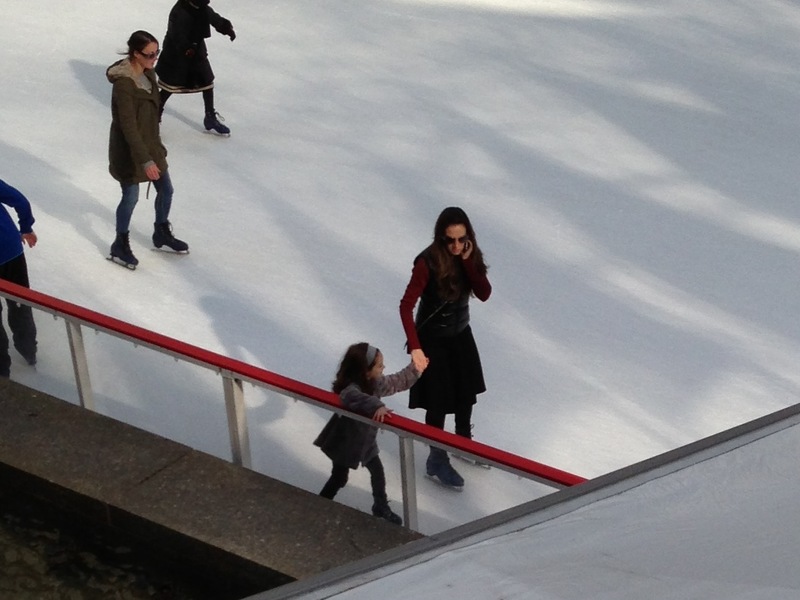 A mother and her sweet little daughter gracefully gliding around the rink, hand in hand. What a beautiful moment, and one I’m sure the little girl will cherish for years to come. That lasted for about a half a lap. Mom’s cell phone rang and she spent the remainder of their time together on the ice yammering into her phone. It must have been a pretty important call. The little girl would occasionally slip on the ice and mom would just yank her up onto her feet again. She wouldn’t even interrupt her conversation to help her. I wanted to climb down onto the ice and cross check her into the boards. But that would have been crazy, right? Yes dear, mother loves spending time with you, but what’s coming out of that phone is far more interesting than what you have to offer. What a terrible, lost opportunity. Teach your children well, indeed. This entry was posted in Memoirs, NYC: A Users Guide by Exile on Pain Street. Bookmark the permalink. Well, we can’t judge Mother without knowing what the call was about – it may have been from the hospital where her dad was having bypass surgery. As for the Frenchman, I’d like to know many blacks and Puerto Ricans he saw in the slums of Morocco. Maybe he was having a panic attack at the time. Hey, what’s the big idea?! None of that benefit-of-the-doubt malarkey here in my sandbox. You apes are a compassionate bunch. That’ll never fly if you ever get involved with human politics. Just so you know.I, too, wondered if Morocco was a big destination for poor, wayward Puerto Ricans. It doesn’t seem likely. That damaged his credibility with me. Funny how most racists’ knowledge of geography is a little shaky…Mommy with the cell phone? Just rude. It’s not just geography they’re shaky on. The funny/sad thing is, I’ll bet if I had blasted him for his comments, he probably would’ve denied having a racist bone in his body. They’re always the last to know. “….one of those nutty out of work actors….” ?? Hmmmm.A touch of racism there, my dear. lol! Having been an out of work actor and probably “nutty”, I resemble that remark….Your Cabbie sounded pretty horrible! But, an out of work actor…..I doubt it. I love that you said the area that you lived in back then is so gentrified now that you couldn’t afford to live in your old apartment. New York is such an interesting place….When I was a little Girl, the East Side was “OUT” and The West Side was THE ‘in’ place to live. Then, that changed and the Esst Side became the fashionable side and the West side was “OUT”….Now, I understand, there is the beginning of a swing back again. Go figure1what a sad sad picture—the little girl skating and her mother on the phone. Is this our life now? I think it is hideous! Everyone on their cell phones, talking and texting and NOT being with the people who sre there with them, in The Flesh. Pitiful, really. You mustn’t be offended! My best girlfriends and biggest heartaches were all actresses. I love actors! That’s why I spend so much time and $$$ going to plays. And remember…that was 20 years ago. I didn’t have the sensitivities I do now. I was unedited in my journals. As far as the phone, I thought technology was supposed to set us free. Look what happened! It took a mother away from her little girl. Those journals have also stirred up some very painful episodes that took a long time to put out of my mind. So it hasn’t been all fun and games.I only write about a small fraction of the plays I see. I see about 45-50 a year. I used to write more but I think most people aren’t that interested, and I don’t want to lose the small audience I have. (I suppose I shouldn’t care about that stuff but I do.) I had little interest in theater until I moved to NYC but I found it to be a good night out almost as soon as I arrived. There was a two or three year break when my first daughter came along but I’m back up to full speed. Aw, shucks. You know me better than that. You know I’m not down on humans as much as I lead on. That’s just for dramatic literary effect. Hell, I love people! If I didn’t like people, I sure as hell wouldn’t have spent all that time in New York City, that’s for damn sure. Glad to hear you’re all aglow in PHX. I used to live there, you know. Too damn hot for me so I got the next train back. Good time of year to be there. I’ve had more positive experiences with cabbies than negative. One guy told my girlfriend and I that he installed a car horn in the back seat just above our heads. We would press the ceiling and the horn would blow! We couldn’t believe it! It turned out to be a practical joke. He was beeping the horn when we pressed the ceiling! We were a little drunk and laughed our asses off. Big tip for that guy. Perhaps she was dealing with a cup-cake crisis. Thunder Road or no Thunder Road, I wouldn’t have forgotten you, you are the guy who gave me Bukowski. I may have an opportunity to visit New York at some point this year (how vague is that?! ), things are afoot, if it comes off I’ll email you. I hope that happens. I’ve had a handful of blogger meet-ups and they’ve all been a blast. I’ll buy a tony cocktail for you and your sir. I’ll throw in a lovely view. It’ll be my pleasure. The Unbearably Banished one puts on quite a good tour! Highly recommended! Wow what a way to say to your kids: “You are only so important.”There are unfortunately many racists in the world, but I’ve noticed that certain cultures are more vocal about it. A very appropriate occasion to withhold a tip! What I found out the hard way is that kids pick things up much, much earlier than I thought. They are impressionable early on. It’s a mean way to treat a little girl. As far as the cabbie, I’m sure he’s still smarting from my tip snub. That’ll teach him. Maybe.